Slow cooker choucroute recipe: How to cook vegetables in a slow cooker. Think You Can’t Cook Vegetables in a Slow Cooker? Think Again. Just when you think you’re out, the slow cooker pulls you back in. The last time we talked about slow cookers, I was nice. I said they cooked beans well. I said they made a very tasty dal. But I also said things like, “The slow cooker did not solve every problem in our lives,” which was a problem because that was precisely why I had wanted a slow cooker. 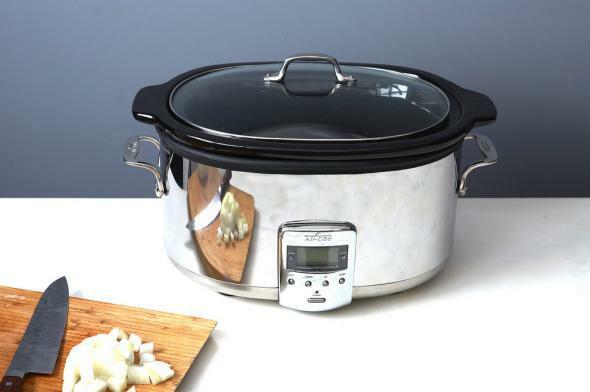 You do not get a slow cooker because you think it will improve your cooking. You get a slow cooker because you think it will improve your life. (That’s why you get a Vitamix too. It’s not why you get an immersion blender.) And I cannot tell you how much improvement my life needed. The slow cooker was very good at cooking beans, but less good at remembering to buy milk for the morning. Also, did it organize my sock drawer? It did not. Were my ambitions unrealistic? Maybe. Did I care? Of course not. But the slow cooker makes you feel like Michael Corleone: Just when you think you are out, it pulls you back in. If your children, out of sheer perversity, insist on eating dinner every night, just the idea of the slow cooker has a gravitational pull on your thoughts. It’s roughly the same pull that the idea of sleep training has on the thoughts of new parents: It cannot be that easy. But what if it is? More food in less time. Well, more food in more time. For more food in less time, of course, you need a pressure cooker. But part of the reason that pressure cookers are still obscure, even though they no longer void your homeowner policy, is that they seem literally incredible: Their promises are too good to be true. Whereas the promises of a slow cooker are all too believable: They promise to stay up all night doing what has to be done. They promise, in short, to be the parent. Basically, it was either polygamy or the slow cooker, and as a nation we went with the slow cooker. A few very idle weeks later, the freezer is now full. And even though I tend to have a Groucho Marx relationship with our freezer—I don’t want to eat anything that I’ve frozen—I am not unhappy about it. The slow cooker is still really good at cooking beans. Some variations: White beans plus a lot of garlic. Black beans plus soy sauce plus sesame oil (from this book). The insanely flavorful frijoles charros de Nuevo León (from this book): beans and tomatoes plus beef chuck plus smoked pork plus canned chipotles. Pinto beans plus a smoked pork hock for breakfast (courtesy of this thread on Food52). The problem is you’ve eaten dinner for breakfast, but then you can have pancakes for dinner, which solves the problem. Also: really good at cooking chili, and if you do not sauté the vegetables first, the sky will not fall. (It helps if your chili includes meat, but it isn’t mandatory.) Also: If you slow cook a huge hunk of meat—brisket, pork shoulder—without browning it first, the sky won’t fall then either. This is important to remember, because not having time to brown something right now is often the reason not to do it at all. But vegetables are the bête noire of the slow cooker, which is why my favorite, just-in-time-for-winter insight is: cabbage. It’s the ideal vegetable for the slow cooker: It wants to melt anyway. An inspired, one-pot-dinner treatment comes from The Southern Slow Cooker, by Kendra Bailey Morris: Southern choucroute. 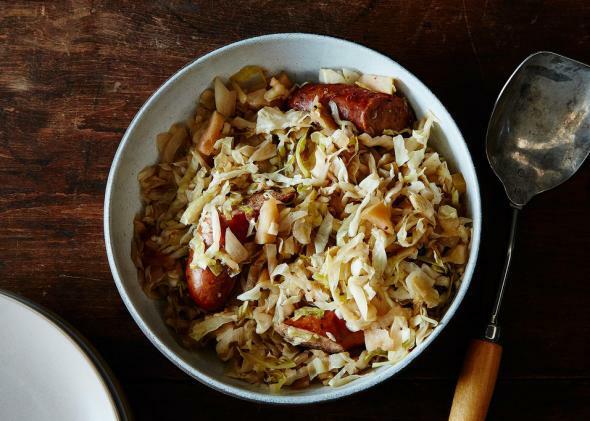 Take cabbage, apples, and smoked sausage; mix with brown sugar, mustard, juniper berries, cider vinegar; press go. The children ate it with abandon. Possibly too much abandon. In retrospect, I recommend having your diners shirtless. See the full recipe at Food52.